The Students Federation of India (SFI) condemning the proposed model act on universities, has appealed to the students and the academic community to oppose it jointly. The Central Executive Committee of SFI at its three-day meeting, which concluded here on December 30, expressed concern that the government was ‘abdicating’ its responsibility towards education by allowing private players to price it beyond the common man’s reach. Calling the proposed model act as ‘draconian’, the SFI called for strong opposition by all those interested in spreading education. It also accused the government of misleading people by claiming that it would achieve the goal of education for all by 2005. It was pointed out that the statistics of the international education agency UNICEF proved that the country cannot achieve this goal in the targeted timeframe. The SFI also said the government was interfering in the autonomy of the Aligarh Muslim University (AMU) by subjecting admission to its various professional courses to common admission tests to be held by various government agencies. A decision to organise a special conference of SFI at Guwahati from February 7 to 10 has also been made. An updated programme and constitution of the federation would be adopted at the conference, which would be held for the first time in the north-eastern region of the country, an SFI release said here. The Leader of Opposition in the Municipal Corporation of Delhi, Mr Subhash Arya, said that children of the poor families who studied in MCD schools faced hardship as a large number of schools run in tents, without floors, electricity, textbooks and drinking water. Jersey was not distributed among the students this year. Last year, the corporation had promised to provide all these basic facilities to the students. It had promised to construct concrete buildings at the place of tents. A total of 101 schools were being run in tents last year. Of them, only buildings of 45 schools have been constructed. Textbook of English language has yet not been distributed among the students, Mr Arya said. Giving details of the pathetic condition of the corporation schools, he said that there was no water connection in 141 schools, 60 schools are deprived of water tanker. Septic tanks have not been cleaned in 78 schools causing unhygienic conditions in toilet blocks. The roofs of 148 schools have not so far been repaired. Windows of 216 schools do not have glasses, walls of 94 schools have not been repaired and 104 schools floors are in damaged condition. The blackboards are not available in 117 schools. Mr Arya claimed that corporation was miserably failed to provide jerseys and mid-day meal to 9.5 lakh children in corporation schools. Till today, only 70 per cent students are being provided cooked mid-day meal. Sometime ago, dead rat and worms were found in cooked mid-day meal. The corporation had promised to distribute four lakh jerseys among the students, but so far not a single student has been provided the jersey. Two hundred fifty posts of headmasters in 1,850 municipal schools are lying vacant. Migrated Kashmiri teachers and the teachers engaged on contract are being paid for ten months only and for remaining two months they are retrenched, which is injustice and exploitation. He demanded that these teachers should be engaged in Education, he said. The corporation had decided to provide two uniforms to the children, but it has not been done so far. All funds for primary education have been provided by the Centre or the state government, but it has not been utilised by the administration. However, giving clarification of these allegations, Ram Babu Sharma, former Chairman of the Standing Committee said that MCD had received lot of jerseys and it would be distributed within a day or two. The corporation is getting the supply of the jerseys in a phase manner. As soon as the corporation received the supply, it will be distributed. The corporation promised to distribute the jerseys by December 31. But it was delayed only for a few days because of checking of qualities of the woolen clothes, he said. The NCC Republic Day camp 2004 began here with the opening address by the Lt. Gen. B H Bopanna, AVSM, VSM, Director General NCC. A total of 1,810 cadets including boys and girls drawn from over 16 NCC Directorates covering all the states and Union Territories of the company are participating in the Republic Day camp. The cadets will take part in a number of activities like cultural programmes, national integration awareness and institutional training competitions. The cadets will also take part in the Prime Minister’s NCC rally on the 27th of this month. Addressing the cadets here today, Lt. General Bopanna said that the aim of the camp is not only to give the cadets a glimpse of the national capital and exposure to some of the important events that take place in the Capital, but also to project to the nation the values of, which NCC stands for. The cadet also took part in the oath-taking ceremony on the occasion of the New Year. A well-known social activist, Mr T. C. Alakh, has been unanimously elected as the president of the Sonepat unit of the Youth Hostel Association of India. According to a report, the other office-bearers elected are: Dr P. M. Gaur (Chairman), Ram Avtar Gupta, Pradeep Gautam and Dr Shakuntala Gakhar (Vice-Presidents), Bal Kishan Sharma (Secretary), Prof O. P. Garg and C. D. Aneja (Organising Secretaries) and K. K. Garg (Treasurer). Montage Arts is showcasing the works of the renowned artist, Suhas Nimbalkar at the Shridharani Art Gallery, Triveni Kala Sangam from January 2 to January 10. Entitled “Jhini Jhini Bini Chadariya”, the exhibition is a humble tribute to simplicity and innocence for which the artist is known in the art world. According to critics, “Suhas’s paintings do not either overtly legitimise a cultural past or subvert the system of power that colonised the innocent past but rather focus on the contradiction of the centre and the periphery located in the artist’s mind in the most non-interaventionist way.” Hidden tensions are implicit in his “apparent calmly surfaced paintings”. Most of his paintings have acrylic on canvas as the medium. The paintings, with intricate, colourful designs intermingled with triangles, have soothing effect on the eyes. Manthan Kala Academy had the Capital’s theatre buffs splitting their sides with their comic play ‘Kuchh Khatti Kuchh Meethi’. The play was staged with the underlying theme of propagating family values. Having won critical acclaim in the USA for their blending of hilarious and punchy dialogues, Manthan tried to get Delhiites give them a thumbs-up too. Comic scenes from ‘Kuchh Khatti Kuchh Meethi’ will have you in stitches. 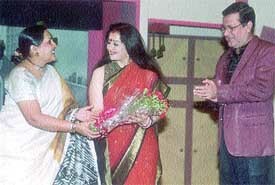 Feroz Bhagat, a veteran theater actor, director and producer and Apara Mehta of the popular TV serials ‘Kyunki Saas bhi kabhi bahu thi’ gave a perfect display of their acting and timing skills. The play is about a hardworking couple raising two sons and the conflicts arising with the marriage of these sons. This family has just shifted from their humble dwellings to their new abode, which has cost them a neat Rs 30 lakh. The increasing needs and the sons’ shrinking pockets divide the house into two. It is a social theme-based comedy, to be enjoyed by the whole family. The story of Shantilal and his disintegrating family tells the real life story of today’s society. The play ends with the sons realising their folly and the parents asking them to leave the house so that they can grow. The Manthan Kala Academy was formed seven years ago with the objective of promoting and inspiring art and culture and providing healthy entertainment. Isha Music and Music Today have established themselves as one of the leaders in music and dedicated to the promotion of the Indian Vedic heritage through the medium of music. Both believe in the art of presentation and this is the reason they have some of the best merchandise material promoting their albums. Manu Gupta, director-Isha music, has conceptualised the cassette of Aarti to satisfy the thirst of devotees. Aarti is inseparable part of the Indian system of worship. Worship is considered incomplete without Aarti. The prayer that gets the mind totally involved with the deity is Aarti. Aarti describes the qualities of the god or goddess who is being worshipped. It is always recited at the end of Puja or prayers. Aarti by itself is also a complete Puja: each Aarti is dedicated to some god or goddess. All Jaap, Taap, Puja and Hawan are the elaborate forms of Puja, which are condensed in the form of Aarti. The reason Aarti is prescribed at the end of the puja is, that we tend to commit mistakes in our puja due to lack of knowledge of mantras and method of performing puja. All those who have participated in performing an Aarti will find that it is always done with the help of a lamp or a diya. Aarti is also another way of doing the deep-dan. In this album, the most popular and some rare Aartis have been compiled over a period of time. Manu Gupta, Director-Isha Music, has been making available the chain of Katha, Bhajan, Mantra, and Mahamantra in the form of songs for many years. Renowned dhrupad singer Gundecha Bandhu, renowned vocalist Shubha Mudgal, Jeetendra Singh and Soma Singh have sung Aarti. In this cassette, Aarti Parichaya and Aarti Mahima are narrated by Manu Gupta. A story of passion, self-reliance and a burning desire to succeed in challenging times. Celebrating life is a passion with the multifaceted Sachin Gupta. A computer techie, Sachin’s first love remains theatre and on Sunday, Delhi witnesses his love for the stage. 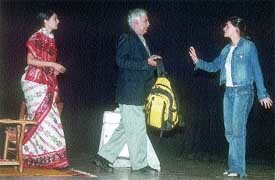 ‘Celebration of Life’ his maiden production under the banner Chilsag Chillies, is a powerful and moving play in English. “It is a story of passion, self-reliance and a burning desire to excel and succeed in challenging times,” claims Sachin. Based on the lives of two girls Kanishka, a promising dancer who has already reached the zenith of her profession, but throws her life away by mixing with the wrong people and getting hooked onto drugs and Chetna, a girl who is yet to achieve her dreams, but has been diagnosed with a life-threatening disease. Undeterred Chetna goes ahead in pursuing her dreams. 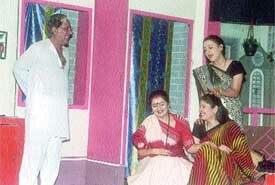 The play boasts of good performance and well-choreographed dances. Props have been kept to the minimum to create a natural effect along with lighting and sound.